Monitoring the Future is an annual survey of 8th, 10th, and 12th-graders conducted by researchers at the University of Michigan, Ann Arbor, under a grant from the National Institute on Drug Abuse, part of the National Institutes of Health. 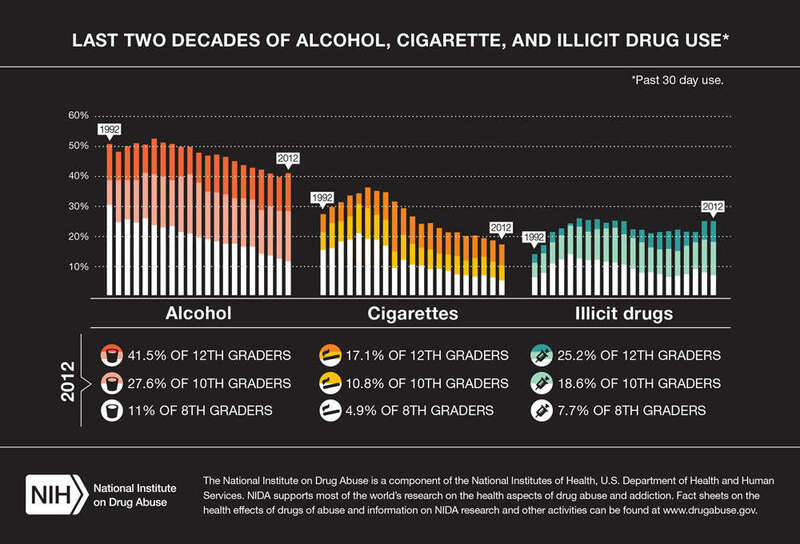 Since 1975, the survey has measured drug, alcohol, and cigarette use and related attitudes in 12th-graders nationwide. Eighth and 10th graders were added to the survey in 1991. Overall, 45,449 students from 395 public and private schools participated in the 2012 survey. 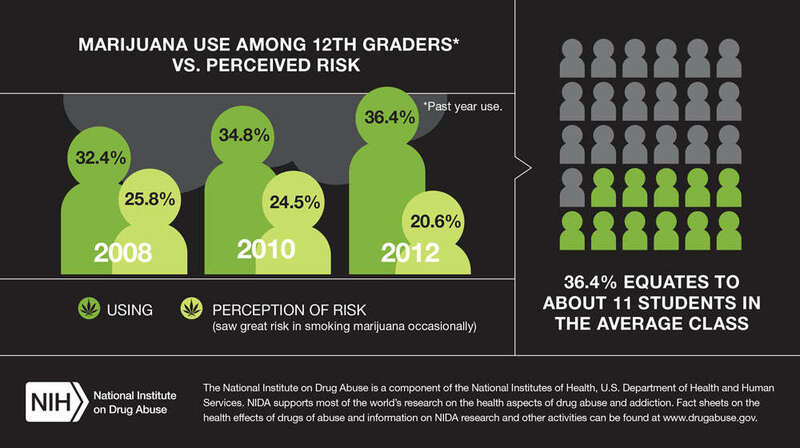 Three points in time are shown—2008, 2010, and 2012— for marijuana use and the perception of risk (saw great risk in smoking marijuana occasionally) among 12th graders. 36.4% equates to about 11 students in the average class. A study released earlier this year showed that people who used marijuana heavily in their teens and continued through adulthood showed a significant drop in IQ between the ages of 13 and 38—an average of 8 points for those who met criteria for marijuana dependence. Those who never used marijuana showed no declines in IQ. After marijuana, prescription and over-the-counter medications account for most of the top drugs abused by 12th graders in the past year. 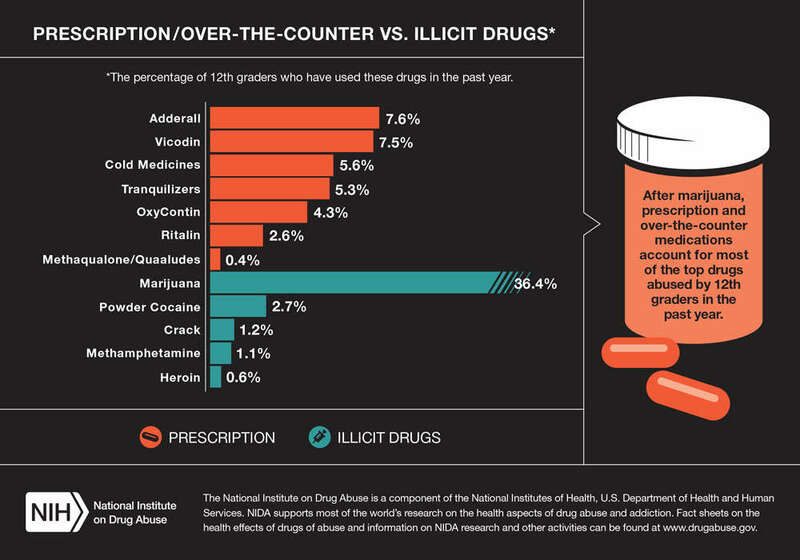 This list shows the percentage of 12th graders who have used the following drugs in the past year. Bottom figure: What Are “Bath Salts”? “Bath salts” are an emerging class of drugs containing one or more synthetic stimulants, which people use to get high by swallowing, snorting, or injecting. Because these drugs are relatively new, much is still unknown about how these substances affect the brain and body. They have been linked to an alarming surge in visits to emergency departments and poison control centers due to cardiac and psychiatric symptoms. Concerns about the use of “bath salts” prompted its inclusion in the survey for the first time in 2012. 1.3% of 12th-graders reported past year use.